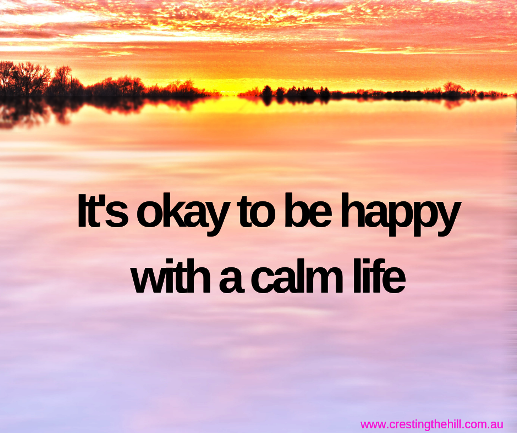 It seems these days that wanting a calm life is something to apologize for at times. Everyone is busy making their bucket lists, or ticking off existing ones. They're planning vacations, working extra hours, running full speed ahead with whatever new project they've set their mind to. But what happens if all you want is a calm life - a life that just cruises along without too many upheavals? I wonder if my desire for calm is because there have been a lot of ups and downs for us over the years? We've had a multitude of job changes, rises and dips in our income, juggling kids' needs and activities. We've successfully launched our kids into the big, wide world and watched them find their feet, settle into careers, find their life partners, and produce a couple of lovely grandgirls. It seems like life has just flown by and the storms have passed - the waters are calm and we're floating pleasantly. I don't feel like I need to stir things up again just yet. I'm happy with where we are, the work we have, the family time we manage to find, the comfort of a good marriage, enough income to more than meet our needs, a lovely home, a good life. I refuse to feel out-classed by those who are still riding the waves and wanting to go further and faster than me. I'm happy to watch them and to enjoy the pleasantness of being happy with where I'm at. The more calm I find in life - the better I like it! I think a lot of the calm I mentioned above comes from being content. I've had many moments in my life where I haven't been content. Times where I've yearned for more, or been dissatisfied with my lot in life. There have been times of struggle, times of misunderstandings, times when I wondered what the point was in pushing through one difficulty, only to find another one waiting around the corner. I also spent many, many years being afraid to be too happy - because I was so sure that if I took happiness for granted, it would be turned around on me and something bad would be lurking on the horizon, ready to say "I told you so" and steal the joy away and replace it with another problem to cope with. I'm not sure where I got that belief from, but it hung around for a long time and it coloured a lot of the good times with an air of waiting for the pendulum to swing in the other direction. Now I'm learning to live in the moment more. I'm learning that it's okay to be happy. That being happy isn't a huge privilege, that it's just part of life. Also, if tough times come, I'll deal with them then - not sit around waiting for them and spoiling the good times with "what ifs". It's lovely to just sit and be content with life - to appreciate all that I've been blessed with and to be thankful and at peace with where I'm at. God is good, and I'm grateful and I'm content - it's lovely to be able to write that and to believe it in my heart. And I also want to share with you a beautiful quote that sums up how I want to live my life now. Are you calm and content or do you need to find more of that inner peace? Have you found your sweet spot in life, or are you busy riding the waves or being buffeted by one of life's storms? 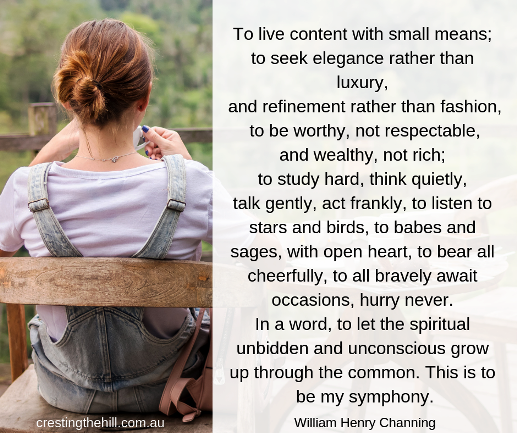 I really hope you find contentment if it's eluding you - it's worth seeking wholeheartedly. Hi, Leanne - So far I have found that the older I get, the calmer and more content I become. I hope that this is a lifelong trend. Fingers crossed! I think for the first time in my life I am calm and content. I think it's an old-age thing. ha ha! No, in all seriousness, once the kids are gone, life just settles down and we can just sit back and enjoy. Love it! I definitely think the empty nest brings more peace and calmness Amy. I like that there are less personalities in the mix and things are much quieter! I can't say I'm calm and content yet. Things are a pretty crazy right now. I still have some storms to plow through. Looking forward to the calm after the storms. I hope your calm comes soon Rebecca. Storms are a bit of a pain at this age and stage - we just want some calm waters and smooth sailing! I am not hard to please - never really have been. I think that is why part of my given Chinese name is "content" - calm, on the other hand, is somewhat of a new experience for me. Like you, we've had ups and downs which made calm difficult. This is certainly something I've welcomed as I hit midlife. Thanks for another thought-provoking post. I don't think "content" will ever be my middle name Janet - but I'm a lot closer than I used to be. I think I've finally found my mid point where things are in a pretty good balance between dreams and reality! I think the older I get, the more I appreciate calm and contentment in life. I never really sought drama and now I actively avoid it as much as possible. I am trying to learn to sit still for 10 minutes each morning to meditate. It's tough, but I feel better when I do it. 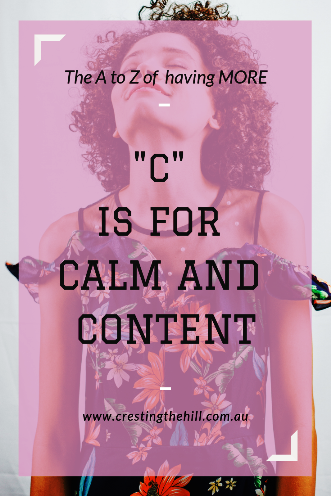 I have calm and content as too major objectives for Midlife - I know others want excitement and adventure, but not me - just leave me some peace and some head space and I'm a happy girl. I'm getting closer Jeremy - and it's a very pleasant place to be in! Not even close yet, but definitely working towards it! I used to fight contentment & constantly look for more...something else. 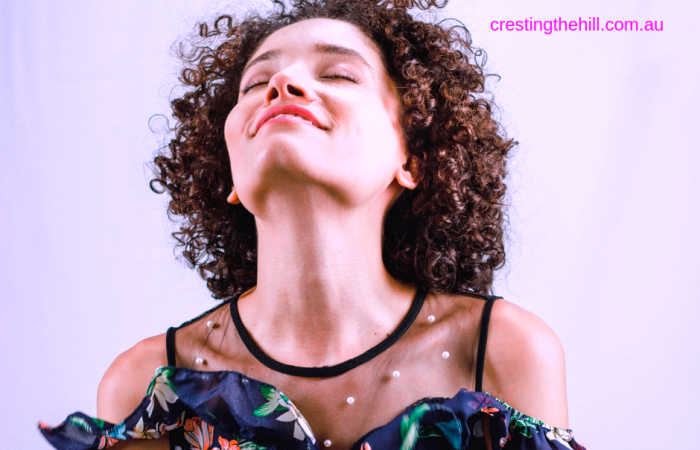 These days, though, I'm finding that I need the grounding that contentment brings - without getting too comfortable, that is! I've never fought it Jo - searched for it, missed it, passed over it, but never chosen to go against it - now I've discovered it, I'm hanging on tight! You sound just like me Min - travel is nice but there's no place like home. I love the peace and 'settledness' of being in my own home environment. I think the striving is something I've left behind these days - I'm happy just cruising - no competition and no yearning for things I can't have. Hi Sue - I think contentment tends to fly out the window when we're struggling with difficult times. I really hope you come out the end of the tunnel and rediscover it again soon. I've reached a stage in life where I'm quite happy with who and what I have in my life - to get more involves too much effort - so I think I have the balance as close to perfect as possible for now - but happiness is definitely a big one too. Leanne, love this post and that Channing quote. Calm and contentment are two worthy goals for anyone of any age. I have had insight to calm and contentment just today after some rocky weeks. In fact, years because of my worry-wart nature and a cancer diagnosis. It might seem odd but now my cancer people do not want to see me for another 2 months I am adjusting to ...'what? no appointments?' so now, I get to choose how I spend more of my time and it is beginning to feel goooood.